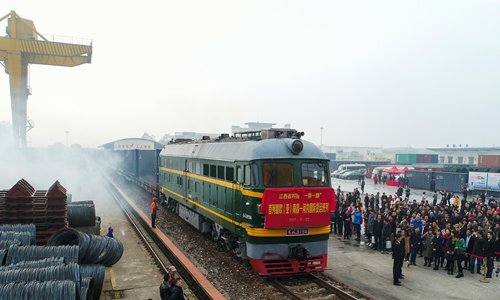 A freight train operated by China Railway Express, which links China and Eurasia, carries tons of daily necessities such as socks and handbags from Yiwu, East China's Zhejiang Province to London. The new freight route, which is part of the Belt and Road (B&R) initiative, also brings authentic British products such as whisky and baby formula to the world's second-largest economy. Other B&R projects have also raised concerns in the West. With Germany and Belgium both seen growing wary of Chinese investment in Greece, its largest port - Piraeus - mainly owned by COSCO Shipping, serves as China's new gateway to Europe, the New York Times reported in April. "Chinese investment is fundamentally different from that coming from the West decades ago, as some Western projects were aimed at strengthening political allies," said Huang Rihan, an expert with the Beijing-based Center for China & Globalization. India had the chance to build the port of Hambantota years ago, but it rejected this option. "Unlike India, which holds an offensive view on regional cooperation, China wants to 'make the cake bigger' and benefit more people, that's the fundamental difference," the expert said. The trend echoed the call from experts for more cautious outbound investment. "For 2018, it's important to build up some sustainable projects to prove that the Chinese model is working," Wang said.